Are low-wage workers going to replaced by robots? 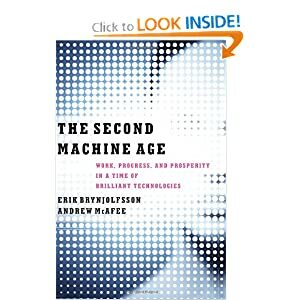 There are cases to be made for that happening, both here: The Shift From Low-Wage Worker to Robot Worker from FiveThirtyEight and from the recent book, The Second Machine age (pictured above). Indeed, some have argued that fast food restaurants are a form of manufacturing, and this makes the notion of replacing works with machines more plausible to me. It is important not just to look at the future, but also the past, in particular, the history of the automat. 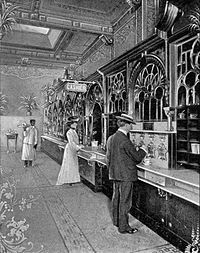 The automat was once the future too, and there are still vestiges of them around, but mainly they have died off. There were a number of reasons for this (see Automat – Wikipedia, the free encyclopedia), but inflexibility was one of them. Right now fast food establishments thrive on inflexibility and low cost.That is also the way to compete with them. I can see how people can compete with that and win, and the way to do that is portable food (e.g., food trucks, food stalls). Barring bureaucratic costs, portable food is cheaper to deliver than traditional bricks and mortar establishments (even fast food ones). And portable food vendors can be much more flexible than fast food places can ever be. The other way to compete with them is by being human and offering better service. No robot in the next century will be able to do that. Is the Dropbox DMCA takedown thing new? And can Dropbox even do that? If your files are important, I recommend you don’t make Dropbox your one and only place to store them. The more important files are to you, the more backups you should have. Microsoft is providing Office for the iPad, starting today (See this for some of the highlights: Microsoft Office For iPad Launches Today). Back in 1997, Microsoft was dominant and Apple was dramatically regrouping. Apple needed Microsoft, especially their software. Now Microsoft is trying to pivot from the PC market (which is rapidly declining) to the future, which is mobile and cloud based. A future where Apple is currently one of the dominant players, and Microsoft is struggling. Microsoft needs Apple’s hardware, just like once Apple needed Microsoft’s software. It is hard to say if this is going to change things around for Microsoft. I never count them out, ever. In the meantime, this is another sign that their transition is still a work in progress. Over at Operating Partner, DFJ, Heide Roizen has a great case study of how to negotiate with someone as tough to deal with as Steve Jobs. You may not be in IT, and you may never have to negotiate with someone as demanding and smart as Jobs, but check it out: you can learn something useful and read a great story too.